He said that the difficulty was that the decision to change the system rested with those people, who would be "the first to be thrown out if their system failed". 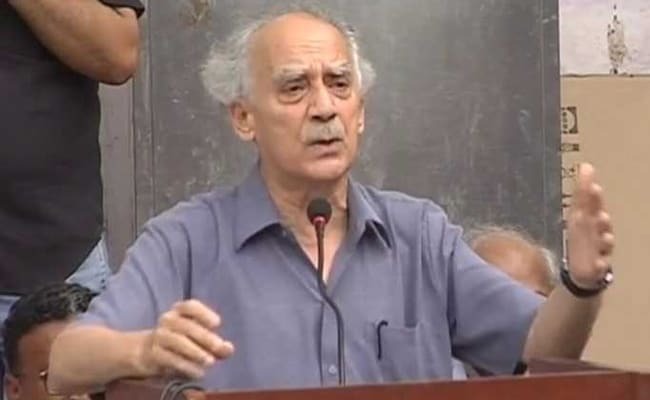 New Delhi: The pressure to bring about change in the present electoral system, which is "not showing up leaders" with competence and integrity, should come from the society, former Union Minister Arun Shourie said today. He said this while addressing the 'Tomorrow's India Global Summit 2017' in New Delhi. "I think the central problem for India today is that the present electoral system is not showing up leaders who have the competence, integrity and dedication for the masses which are required to take a billion people ahead in the world," Mr Shourie said. He added that the difficulty was that the decision to change the system rested with those people, who would be "the first to be thrown out if their system failed". "Therefore, the pressure should come from the society," Mr Shourie said. Referring to advancements in technology such as robots being used in the medical sector, he said policy-making should be done keeping in mind the changes going to be faced in the future. Mr Shourie claimed that the 'Make in India' campaign of the Centre was only focussing on "brick and mortar factories", which he said were going to be obsolete due to the advancements in technology, including in nanotechnology, in the future. Similarly, he said entrepreneurs were taking part in coal auctions for a 30-year supply, despite the fact that coal was not going to be an efficient source of fuel by then. Talking about reservations, the former Union minister said there was a situation in the country where "half of the senior most posts" in all government organisations were "given not on the basis of your qualification, but on the basis of birth". "And, you are going to compete with China, which is consciously working towards meritocracy," he said. Mr Satyadev Pachauri, a minister in the Uttar Pradesh government, and author Chetan Bhagat were present on the occasion among others.